The file system management is fine in Linux, but effectively searching the file system for specific files like mp3 (.mp3) , text (.txt), movie (.avi, .divx etc. ), pictures (.jpeg, .bmp, .png) or documents (.doc) is one thing that most oflinux users miss from their Windows Desktop. Beagle is one of the most useful and exhaustive desktop search replacement we could find for linux. The list of supported files types is very large ranging from images, audio, video, documents, DEB and RPM packages, Email from Evolution and Thunderbird , IM logs and even RSS feeds. Beagle can be invoked and run either from Command line or Web interface, while Command line is more powerful as you can specify exact phrases, words or even logical operators (AND, OR) or even use metadata of audio and image files. Beagle achieves efficiency by building non-redundant index of files, which is comparatively smaller than other engines. For a 45 Gb partition, index was around 700 Mb. Google Desktop search for linux also supports many file types like Openoffice and MSoffice files, PDF, Html and others. 1. It does not index zipped archives. 2. You cannot add new file types at all. The noteworthy feature is you can point ot the exact directory where you are looking for a particular life. Otherwise, it is just useful for average office use and is useless for a power user like me. Supported file types: HTML, plain text, PDF, Microsoft Office (doc, xls, ppt), Microsoft Office 2007 (docx, xlsx, pptx), OpenOffice.org Writer, Calc, Draw, and Impress, RTF, AbiWord (abw, abw.gz, zabw), CHM, Visio, SVG. DocFetcher is coded in Java, so naturally it is fast in indexing and easy on CPU resources. It also supports regular expressions, phrase search and logical operators (AND, OR, NOT). Like GDS (Google Desktop search) it also does not search zipped archives. One interesting query feature found is: Boosting terms, using which you can assign custom weights to words, thus increasing or decreasing the level of matching of words. Tracker is a part of Gnome project. It introduces the concept of file tags, which is in my view overcomplicates the file system management. The list of file types supported is quite large, still there is no Bookmarks, EMails or Contact search support. The biggest downside is that indexer is the slowest among all those we compared. GNOME is a desktop environment and an international project that includes creating software development frameworks, selecting application software for the desktop, and working on the programs which manage application launching, file handling, and window and task management. GNOME is part of the GNU Project and can be used with various Unix-like operating systems – most notably those built on top of the Linux kernel and the GNU userland. “Lightweight X11 Desktop Environment”, is an extremely fast, performing and energy saving desktop environment. It is maintained by an international community of developers and comes with a beautiful interface, multi-language support, standard keyboard short cuts and additional features like tabbed file browsing. LXDE uses less CPU and less RAM. It is especially designed for cloud computers with low hardware specifications like netbooks, mobile devices (e.g. MIDs) or older computers. LXDE can be installed with distributions like Ubuntu or Debian. It provides a fast desktop experience connecting easily with applications in the cloud. LXDE supports a wealth of programs, that can be installed with Linux systems locally. The source code of LXDE is licensed partly under the terms of the General Public License and partly under the LGPL. It needs less CPU and performs extremely well with reasonable memory. It runs well even on older computers produced in 1999. It requires less energy to perform tasks to other systems on the market. It includes an internationalized and polished user interface powered by GTK+ 2. It provides a choice to use the simple eeepc like Launcher user interface or a MS Windows like application panel. It is easy to customize the look and feel of LXDE. It offers additional features like tabbed file browsing or menu run dialogs known from operating systems like Mac OS. Icons of new applications show up after install on desktop. Every component can be used independently from other components of LXDE offering the flexibility to use LXDE parts with different Unix like systems. Single-click install is another new-to-SLED 11 feature that makes installing application programs a breeze. We tested this out with the just-released MonoDevelop 2.0. There are actually three options on the download page, and you’ll need to pick the openSUSE 11.1 button for SLED 11. Version 2.4 of the core Mono components were also released this week. The download page has instructions for using the zypper command line tool to add the mono repository and perform the upgrade with three instructions. The default file system has changed from ReiserFS to ext3 with SLED11. There are some basic differences between the two, including maximum individual file size. For ext3 that number is 2 TB and shouldn’t be an issue for the typical desktop user. ReiserFS supports file sizes up to 1024 TB or 1 EB (Exabyte) and would make sense in a server-based environment. The entire process takes less than 30 minutes start to finish. After the first boot we ran into a minor problem with broadcom wireless networking in that we couldn’t see any networks. This required a driver downloaded from the Broadcom site. Once that’s obtained you simply double click on the file, and installation happens automatically. This is a known issue, and Novell support identified it right off. SLED 11 uses Novell’s update service to provide automated security and program updates. This requires an activation code that you get from Novell. You will be prompted during the installation process for this code although you can choose to skip that step and configure the service later. You’ll also need an active Internet connection to complete the registration process. Another feature carried over from the previous version has to do with Windows networking interoperability. By default SLED has the firewall turned on and all interfaces assigned to the “external” zone. This is the highest level of protection and essentially blocks the ability to browse a Windows network. There are several ways to fix this issue depending on your approach to security. You could just turn off the firewall, but this isn’t a recommended best practice. The easiest way is to set your network interface to the internal zone. This probably works fine for a wired connection but not the best idea for a laptop you use to connect to public WiFi. The third option is to set a few firewall rules to open up the proper ports for Windows networking, but this one requires some understanding of port numbers and the firewall configuration tool. SLED 11 has a definite high intensity focus on security, and it includes both SELinux and AppArmor. With that in mind it’s important to note that basic SELinux (Security-Enhanced Linux) capabilities have been added but not enabled in the base distribution. While the capabilities have been added, Novell is not offering direct support for this configuration at this time. Novell’s AppArmor product ships as an integral part of SLED 11. From the SLED 11 release notes: “The AppArmor intrusion prevention framework builds a firewall around your applications by limiting the access to files, directories, and POSIX capabilities to the minimum required for normal operation. AppArmor protection can be enabled via the AppArmor control panel, located in YaST under Novell AppArmor.” Note that you should use only SELinux or AppArmor; don’t use both at the same time. This release of the SLED product brings features from the latest distributions to a fully-supported enterprise offering. If you were a previous SLED user it had to be hard to watch the innovation happening with openSUSE and not have the same features available for use. The increased emphasis on security should help get the product more notice from the decision makers that count. 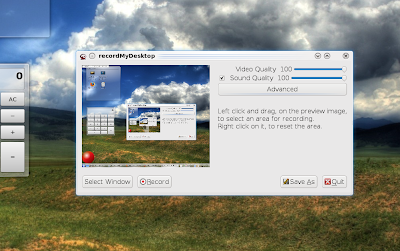 However there was a problem recording visual effects in Kubuntu, the resulted screencast having many artefacts. Not many can argue against this one. K3b is the most popular burning application for Linux, and although it uses KDE3 libraries, many GNOME users prefer it too over native GTK burners. The version I’m going to talk about is 1.0.5 for KDE3, but K3b 2.0 for KDE4 is in the works, and the second alpha was made available for testing purposes earlier this year. You can read my review of K3b 2.0 Alpha 1 here. K3b can burn anything, from audio CDs to DVDs or ISO images. It allows you to save the projects, it includes a powerful file explorer and an easy to use interface. You can also use K3b to create CD/DVD ISO images, it supports projects, multisession mode and ripping video DVDs. 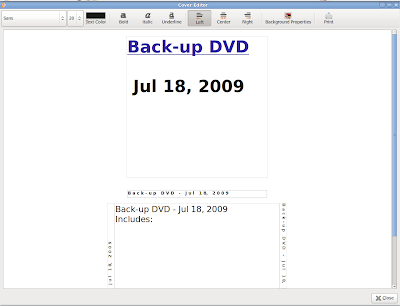 The nice thing I found about Brasero is that it also includes a simple but useful cover editor for your CDs or DVDs. I think GnomeBaker is a little underrated by some. 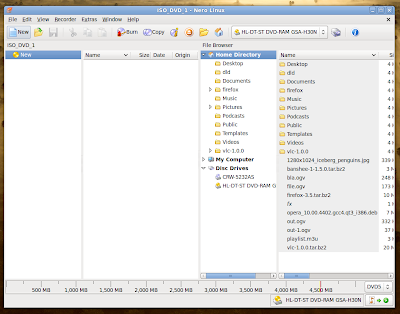 It has a simple interface, which kind of resembles the one of K3b, with the file explorer in the middle of the main window. GnomeBaker can burn CDs, DVDs, audio CDs, CD/DVD ISO images, it supports multisession mode, dragging and dropping files and projects. A very good alternative to Brasero for GNOME users. Several others are also worth mentioning. We have MyBashBurn, which is a wonderful text user interface frontend to cdrtools and growisofs for burning CDs/DVDs, it supports multisession and burning ISO images too. There is also Nero Linux, which is great, but unfortunately closed-source, from the same project which does Nero for Windows. A trial version is available for download here. In Ubuntu, just download the (currently) nerolinux-3.5.3.1-x86.deb file and use sudo dpkg -i nerolinux-3.5.3.1-x86.deb to install it.